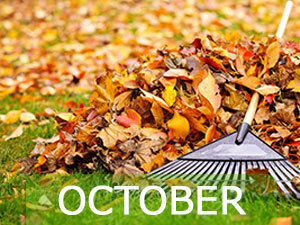 It may seem like there can’t be much left for the last couple of months, but we have dedicated October to our own ‘Autumn Clean’. Follow these tips for an optimal October. – GREENHOUSE EFFECT: By now you should have successfully harvested all of your crops and left a reasonably bare glass house behind. Cleaning and disinfecting your structure will enable more light into it, preventing an unfortunate case of wintry disease. – CLEAN YOUR TREES: Bugs can be quite harmful to your trees in winter, so be sure to apply a winter wash to the trunks of them to prevent this from happening. – LEAF REMOVAL: To stop possible suffocation of your lawns, be sure to remove any dead and fallen leaves off it to allow in light.